Vivo User Lock Remove Tool is a small application for windows computer which allows you to remove the User lock protection from your Vivo Smartphone and Tablets. It supports removing the user lock protection from the Vivo Y53, Vivo V5 Plus, Vivo Y55S. Vivo V7 Plus Smartphone in a single click only. It order to use the Tool you need to boot your device to the EDL mode and connect it to the computer using the USB Cable. And once your device is connected to the computer, you need to launch the tool and press any key to begin the unlocking process. In order to use the Vivo User Lock Remove Tool properly, you need to install the Universal ADB Driver on your Computer. Once Driver is installed you can successfully connect your Android Device to the computer, and launch the Vivo User Lock Tool on the computer. 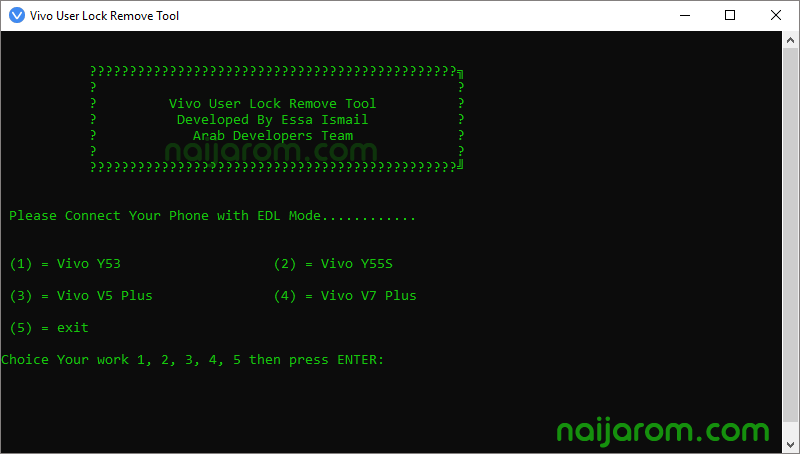 [*] Credits: Vivo User Lock Remove Tool is created and distributed by Essa Ismail (developer). So, full credits goes to Essa Ismail (developer) for sharing the tool for free.